The sequel to American Gods – can’t wait! 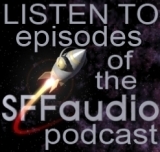 Click here for the SFFAudio Review! This is the second Vorkosigan novel released by Blackstone. To be included in our monthly New Releases post, please contact Scott or Jesse. We’d be happy to include your audio, as long as it is genre related.